Thankyou, for subscribing to our newsletter. 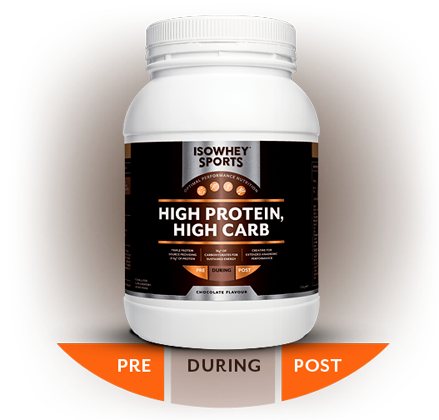 A high protein, high carbohydrate formula designed specifically for athletes with increased energy demands. Featuring a triple protein blend of premium whey protein concentrate and isolate plus casein, the High Protein, High Carb formula aids muscle repair and growth when exercise demands are high. Fast-acting carbohydrate waxy maize starch delivers energy when it is needed, plus high dose amino acids for elite athletes who require a formula to support elevated nutritional needs. Whey protein has rapid absorption and is generally used around the time of exercise, facilitating protein uptake and usage by muscle tissue. WPC is 80% protein and contains lactose and 5% fat. Whereas, WPI is 90% protein and has minimal lactose and fat. WPC generally takes a little longer to digest and absorb due to its additional macronutrient content, but therefore may be useful for athletes wanting to increase muscle size as opposed to maintaining a leaner muscle mass and body composition. calcium caseinate – casein is the protein form that is obtained from the curds fraction of dairy milk (as is cheese); it is high in glutamic acid and is digested at a slower rate than whey protein, thus supplying the body with a sustained release of amino acids. whey protein concentrate – the protein form that remains after excess fluid, fat, carbohydrate and casein are removed from the whey fraction of dairy milk, high in protein fractions and BCAAs. whey protein isolate – is WPC further refined to remove fat and carbohydrate including lactose, giving 90% protein content but lower in bioactive compounds than WPC. 14.6g* of carbohydrates for sustained energy. Creatine provides energy to support contracting muscles during anaerobic exercise. *Based on average amounts per serve. †When consumed as part of a healthy and varied diet. Mix 1 serve into 200mL of water, milk or milk substitute. Consume once daily. High protein diets increase the body's need for water. It is recommended to increase your daily water intake with use of this formula. INGREDIENTS: Whey protein concentrate (45.7%), maltodextrin, sweeteners (xylitol, steviol glycosides), maize starch (5%), cocoa powder, whey protein isolate (3%), calcium caseinate (3%), creatine monohydrate, natural flavours, vitamin and mineral blend (calcium carbonate, magnesium oxide, ascorbic acid [vitamin C], dl-alpha-tocopheryl acetate [vitamin E], ferrous fumarate [iron], nicotinamide [vitamin B3], zinc oxide, manganese sulfate, pyridoxine hydrochloride [vitamin B6], cyanocobalamin [vitamin B12], d-calcium pantothenate [vitamin B5], riboflavin [vitamin B2], retinyl acetate [vitamin A], thiamin hydrochloride [vitamin B1], copper gluconate, sodium molybdate [molybdenum], selenomethionine [selenium], potassium iodate [iodine], cholecalciferol [vitamin D3], chromium nicotinate, folic acid, biotin), L-glutamine, sunflower or soy lecithin, enzymes, Lactobacillus acidophilus, Bifidobacterium lactis. * Based on average amounts. WARNINGS: Contains milk and soy products. Contains xylitol: Excess consumption may have a laxative effect. Phenylketonurics: Contains phenylalanine. Not to be used as a sole source of nutrition. Should be used in conjunction with a balanced diet and appropriate exercise program. Not suitable for children under 15 years of age or pregnant women: Should only be used under medical or dietetic supervision.